Four years later and I'm still annoying you with my recipes, grammatical errors and obsession with food. Take A Bite has gone through many phases of it's life as well as many phases of my life. From terrible Photoshop collages, to dim lit food pictures, from sophomore year of college, to graduation, to my first job, to my second and now we are here. Four years later and I'm prouder than ever of my sweet little TAB. Take A Bite has brought me incredible friends and incredible opportunities I wouldn't have had otherwise. It has allowed me to share my passions for cooking, baking, being creative and sharing with others. Nothing fills me up more than when someone tells me they tried one of my recipes. I write these posts, and sometimes wonder if anyone is reading them. Your comments, pictures, #takeabite hashtags etc. showing that you do, means everything. So thank you. I didn't mean to get so gushy in this post... Let's eat instead! In typical Take A Bite I'm celebrating with Birthday Toast. I have a traditional breakfast every year on own birthday (Belgium waffles with strawberries and whipped cream), so I thought TAB deserved the same. I've been making this almond butter and sprinkle toast the past four years, from the Kappa house, to rent house, to OKC house. 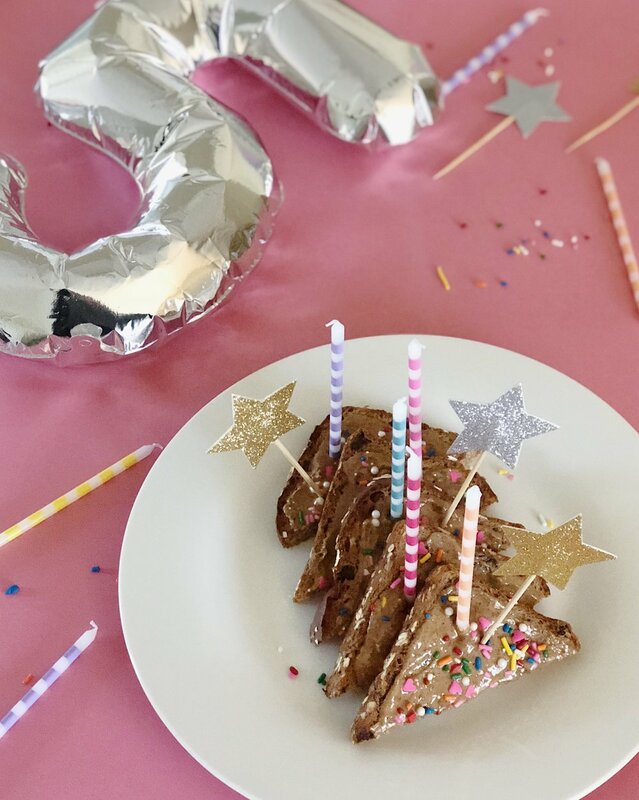 Make you some birthday toast and let's take a look back at some favorite bites. TAB's 1st, 2nd, and 3rd birthday. Here's to many more blog birthdays! Three years ago, I was 19 years old, sitting in the kappa house dining room, reading up how to start a blog and creating amateur blog graphics on an internet photo editor. Three years later, a lot has changed. I've written 147 bites of my life, over 150 recipes, and too many blog posts to count. Take A Bite has gone through my time in college, my summer in DC, graduation, and now real world life. I've grown up with this blog. I'm so thankful for the experiences, opportunities, and friendships I have gained from starting Take A Bite. It's helped me develop something that I truly enjoy, and I love it for that. I'm so interested to see where TAB heads in the coming years. Toast your bread, spread on almond butter and decorate with sprinkles. Sing happy birthday and take a bite! Why does my hand make that look like the smallest piece of bread ever?? I promise it wasn't. Anyway, see more blog birthday posts here and here. Happy Halloween week! I love Halloween, I always have. I used to plan my costumes a year in advance. The second Halloween was over, it was back to the drawing board for next year. I swear against just buying a costume from the party store. It was always homemade and always elaborate. This years costume is ready to go, and food related, as it should be. Okay stay with me for this next part. Secret is out, I was on a sugar detox for the past four weeks. You probably ask, well Annie, what about the brownies you made? What about the cookies? Ya, I actually didn't have any. I licked the spoon here and there just for taste testing, but I actually went a whole month without any sweets. You also probably ask, why would you go on a detox right before the holidays? With all the pumpkin baking and Halloween candy, I saw it as the easiest excuse to say no. I followed Clara's plan with a few modifications. I was strict on no dessert or candy, I didn't use any artificial sweeteners in my coffee or oatmeal, I stuck to plain yogurt and limited my carb and fruit intake. The result. Nothing. After all of that, I found strength to say no to desserts, but I found satisfaction in things like cheese, chips and queso, handfuls of trail mix and binges on almond butter. My advice - don't do it. I think if I would have allowed a sweet treat here and there I would have been less likely to binge in other unhealthy ways. The one positive was my built up will power to say no to copious amounts of sugar. Now that my detox is over I plan on using the will power to eat sweets in moderation, but now I have a lot of fall baking and eating to catch up on. Bring on the pumpkin ice cream, ginger cookies and pumpkin bread! On a pumpkin note, I have a week full of Halloween posts planned. When was the last time I posted every day of the week? If all goes as planned TAB will be busting with bites this week. I've been blog giddy recently; gearing up for something very exciting happening to the blog next Monday. You won't want to miss it. -These slutty brownies got lots of attention last week (just what they wanted, darn sluts). Take a bite of the recipe if you haven't already. -Remember my farm grown green tomatoes from last week? I stuffed them with quinoa, herbs and blue cheese, loosely based off this recipe. -Working on my go-to chocolate chip cookie recipe. Off to a good start, but more testing this week. -A perfect rainy Thursday evening involved wining and dining, great conversation and great friends. -Working on the weekends has its perks when you are friends with the kitchen staff. -Happy early birthday to our leading lady! She's NYC bound this weekend to see oldest sis and I'm extremely jealous.